More than adding flavor to food, spices can contribute to good health and should be an important part of a healthy diet. The health benefits of spices are numerous and include reducing arthritis pain, better digestion, and even a lower risk of heart disease! It is said that “variety is the spice of life.” From a health perspective, we may alter that expression to “having a variety of spices (in our diet) can add to a healthy life.” Why are there so many health benefits of spices? Spices are plant-based and therefore contain a number of healthy plant-based nutrients. Anti-oxidants, anti-microbial, and anti-inflammatory compounds are a few of the many classifications of phyto-nutrients that have been scientifically proven to benefit our health. Although one can obtain phyto-nutrients from eating a variety of fruits and vegetables, the health benefits of spices are unique because they contain unique phyto-chemicals. An example would be capsaicin. This phyto-chemical is found in chile peppers belonging to the capsicum family. While we might normally think of peppers as a vegetable, these are generally regarded as a spice. Capsaicin is the chemical that adds the “heat” felt in the mouth and nose when eating chilis. When capsaicin is detected by nerve receptors in cells, the brain is signaled to release endorphins. Endorphins act as the body’s natural pain killers. Capsaicin’s ability to release these natural pain killers makes it effective in relieving the symptoms of arthritis. We will learn more about other unique phyto-chemicals later in this article. Wars have been fought and new lands discovered due to spices. Important spice routes developed as spices were one of the earliest traded commodities between countries and continents. Spices have a history of being highly esteemed gifts. Debts, taxes, and ransoms were paid with spices and foods preserved with them. Spices played a role in religious ceremonies and rituals. Thousands of years ago, the Egyptians used spices for the process of mummification. Spices are also part of ancient healing arts dating back thousands of years. Proof of spices used in healing traditions can be found in the ancient medical texts of India and China. The Indian healing practice of Aurvedia uses herbs and spices along with a healthy lifestyle to prevent and treat disease. Often the words “spices and herbs” are used interchangeably, but the two do have different qualities. Both are derived from plants but spices are concentrated, dried, edible, and aromatic. They originate from different parts of the plant including the bark, roots, leaves, seeds, flowers or fruits of plants. Most spices come from tropical areas. Herbs are generally from the leaf of a plant and not all herbs are edible. Sometimes an herb leaf will be dried and then labeled a “spice” as it will be used to spice, or enhance, the flavor of food. This is where the definition of a “spice” gets a bit cloudy. While an exact number of spices could not be located in my research, it is safe to say that most household spice racks do not contain near the number of spices that are available. Let’s look at a handful of specific spices to demonstrate the health benefits of spices and the unique history behind them. Black Pepper – Was known as the “king of spices” during the Middle Ages as it was more valuable than gold. A compound found in Indian pepper, piperine helps trigger the digestive process by having the pancreas release its digestive enzymes. Pepper can help food move through the digestive tract faster and help digest food more efficiently. Studies have also linked piperine to preventing certain cancers, lowering high blood pressure, preventing heart disease, and protecting against hearing loss. Cinnamon – The popular combination of “cinnamon and sugar” in baking is more than a complimentary mix of flavors. Cinnamon and sugar could be considered the “yin and yang” of the confection world because they balance each other. It’s commonly known that sugar raises blood glucose (sugar) levels but did you know that cinnamon acts to lower blood sugar? Health benefits of cinnamon also include fighting fungi such as Candida albicans, the cause of yeast infections. Cinnamon also comes in two varieties (cassia cinnamon and true cinnamon). Cassia is slightly sweeter that true cinnamon. Fortunately only discerning palates would be able differentiate between the two but labeling laws in certain countries require the delineation of varieties. Remember the ritual of Egyptian mummification referenced earlier? It was cinnamon that was used in mummification and placed in the tombs of pharaohs. Coriander – The coriander plant provides us with both the herb cilantro (from the leaves) and the spice coriander (from the seeds). One of the oldest recognized spices, coriander is known for aiding digestive issues. It is even an ingredient in certain laxative teas. While coriander isn’t one of the common spices in most homes, it has a sweet, nutty flavor and is a great addition to meats, stews, vegetables, rice or couscous. Tumeric – Eating this yellow spice daily is the equivalent of hitting the health “jackpot of gold”. Popular in India for thousands of years and an important component of curry blends, tumeric offers a great number of health benefits. Curcumin is main phyto-chemical responsible for tumeric’s broad spectrum of health benefits. It is reported that Tumeric has over 50 healing actions including aiding digestion, acting as a decongestant, relieving headaches and improving circulation. 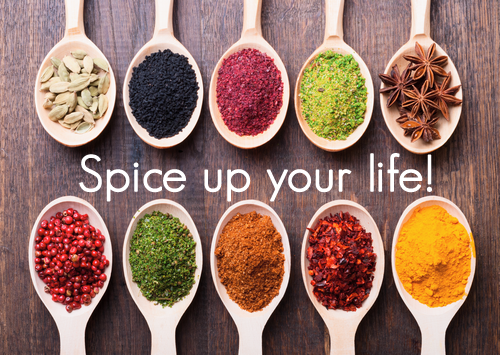 Its anti-oxidant properties, however, make it a spice superstar! In part 2 and part 3 of this series, we will learn about buying and storing spices, using spices in cooking and making your own spice blends. Until then, you can learn more about the health benefits of spices in Dr. Sears’ Prime Time Health program.